Rajkot civic body plans to throw open the museum to public in next five months. 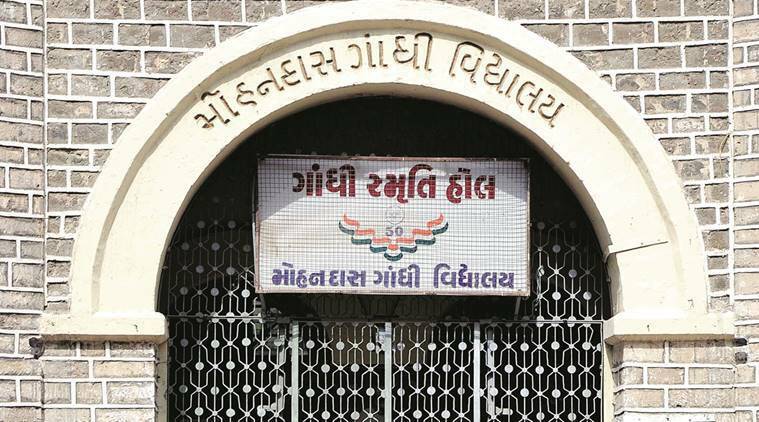 WHILE THE state education department is in the process of closing down the 164-year-old Mohandas Gandhi Vidyalaya in Rajkot, the municipal corporation has made public its plan to convert the alma mater of Mahatma Gandhi into a museum, which will have a mini-theatre, an amphitheatre, 3D video projection facility, a prayer hall, a VIP waiting lounge, gazebos, besides various exhibits depicting life and times of Mahatma Gandhi. Rajkot Mayor Jaiman Upadhyay and Municipal Commissioner Banchhanidhi Pani unveiled the design for the Gandhi memorial on Monday. As per the Rajkot Municipal Corporation’s (RMC) presentation, the school will be converted into an “ideal destination to welcome visitors from across the world to experience and learn the ethics and philosophies of the Father of the Nation.” Hence, the civic body has decided to name it aptly ‘Mahatma Gandhi Anubhuti Kendra’. As part of the project, which is estimated to cost around Rs 15 crore, the civic body will undertake restoration and consolidation of the school’s wooden flooring, trusses and staircases as well as remove the weeds and prune the trees around the building. A ticket counter will be set up at the entrance and a waiting lounge will come up on the compound. Two elevators will be installed at the northern and southern wings of the building besides ramps will be developed, especially for the physically-challenged. There will be paved tracks across the campus for ease of movement. The central courtyard of the building will be converted into an amphitheatre with a seating capacity of over 150 persons and facade of the building will be used as a screen for 3D projection. The experiential centre will also have a prayer hall with an installation of Gandhi in a meditative pose with children listening to him. Besides, there will be a diorama of Dandi March, murals, library and gazebos for tourists. The RMC is planning to throw open the museum in the next five months. “We expect the museum to be thrown open to the public in around five months’ time. We have already floated tenders. Bids will open on May 20. The state government will give Rs 10 crore grant while the RMC will contribute the remaining Rs 5 crore. The private party, which will win the bid for converting the school building into a museum, will also be given a five-year contract for its operation and maintenance,” Mayor Upadhyay said. The RMC had sent a proposal to the state government in March, 2016, proposing to convert the school into a museum. “The number of students in the school is very less. The state government was incurring huge expenditure to run it. So we decided to convert it into a Gandhi museum. The students are being shifted to alternative schools,” said the mayor. He added moreover Rajkot doesn’t have any places to attract international tourists. “Visitors, for example go to Porbandar or neighbouring Rajasthan, which have many places of tourist attractions. The proposed museum will become one such attraction here and will draw tourists from across the world,” said the mayor. The municipal commissioner said that the project doesn’t involve any major new construction. “There are 42 rooms in the building, out of which 36 will house exhibits. The remaining six will be used as office and service rooms. The 20 rooms on the ground floor will display Gandhi’s transformative years. The rooms on the upper floor will depict Mahatma Gandhi’s ideals like ahimsa and sarva dharma sambhava and their relevance in today’s world,” Pani said. Earlier known as Rajkot English School, the historic school was inaugurated in 1853. Around two decades later, another wing was added to the school and it was rechristened as Alfred High School in 1875. Mahatma Gandhi attended the school from 1880 to 1887. In 1971, the then Gujarat government renamed the school as Mohandas Gandhi Vidyalaya. Besides Mahatma Gandhi, the list of eminent alumni of the school include Ucchangrai Dhebar, first chief minister of Saurashtra state, Keshubhai Patel, former chief minister of Gujarat and incumbent Union revenue secretary Hasmukh Adhia.